Writerly Ramblings: Happy New Year's! 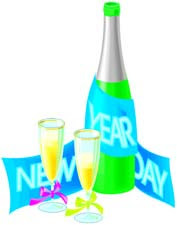 The date of the "new year" varies from society to society. For instance, the Jewish new year, Rosh Hashanah, is celebrated in the fall, while the Chinese New Year begins on the second new moon after winter solstice (late January to mid-February). Until 1753, England and its colonies rang in the new year on March 25, which coincided with a Christian holiday called Lady Day (the Feast of the Annunciation). They made the switch to January 1 when they converted from the Julian calendar to the Gregorian.